They say every dark cloud has a silver lining, and this unfortunate sabbatical has had several. Today I want to talk about one of them– football. Yes, football. . I did not grow up in a sports family, far from it. My dad taught me how to play the piano, not how to throw a curveball. We went to see the Symphony, not the Redskins. I saw George C. Scott at the Lyric Theatre in Baltimore, but never saw one game of the 1969 World Series, which was played a mere 20 miles away. Saturdays were spent listening to the New York Metropolitan Opera on the radio, not watching sports. My dad’s idols were Mozart, not Montana, Beethoven, not Butkis. Joe Namath was just a guy who wore pantyhose. Naturally I did not play any sports in school, either. I was always the last one chosen for volleyball and softball teams. I was the Sheldon Cooper of Glen Burnie High School (but not nearly as smart). My college required two semesters of a sport, so I took tennis. I loved the game so much I took lessons all through law school and during the Missing Years. I played a couple of times a week. But I was never able to get the ball over the net more than three times in a row. I’m not exaggerating. Picture Sheldon’s girlfriend Amy Farrah Fowler trying to play tennis, and you’ve got me. After a while, no one would play with me because I was so bad. So I never watched sports and I can’t play sports. As a result, I have no interest in sports, either playing or watching. That’s why I like to hike. At least I can put one foot in front of the other, although I do fall down a lot. I had never seen a football game until I started dating Billy. His family would spend Sunday afternoons watching the Redskins and picking crabs. Since I didn’t watch the game, I was able to pick a lot more crabs than anyone else. Early in my marriage, my mother in law told me if I loved my husband, I would learn to love football. Well, it took me 32 years to do that. Last fall, Guido was one of the captains of his football team. They had a great team and an excellent chance of winning the state championship. I promised both Billy and Guido that I would attend as many games as I could. I knew that the boys checked the stands at every game to find their parents. I had to be there. The games were played at 4 p.m. on Fridays, which you would think would be a good time to get away from work. But I spent much of Guido’s first game behind the bleachers, on the phone for work. This was just a few weeks before my breakdown and I know it helped to precipitate it. When I sat down on the bleachers, I made the mistake of checking my e-mail. I had a message from a VP, who needed me to do some legal research ASAP for a very URGENT MATTER!!. This was at 4:15. I called outside counsel, who was an expert on the topic. I can’t say what the question was, but the answer was a resounding NO. There was a teeny tiny loophole, but counsel said it was a long shot and would require a written opinion from the agency, which would take months. The VP needed the answer by Monday. When I told the VP the answer was no, he told me to keep looking anyway and see if the loophole would apply. I spent most the game and half of Saturday hopping down this rabbit hole. It turns out that the question had been asked many, many times before and the answer had always been NO. And the VP knew this. While I was dealing with this pointless fire drill, I missed the first touchdown of the season, which was scored by– yup, my son. I was livid. If the legal issue had been legitimate, I wouldn’t have minded missing my son’s first game as captain. But it was not. The purpose had been to help another VP avoid being embarrassed. I knew then that I could not go on like this, no matter how much they paid me. Two weeks later I broke down. As a result, I got to watch every one of my son’s games, both at home and away. During the first month or so, however, it was all I could do to get to the games. In addition to depression, I had agoraphobia. I did not want to leave the house. But now I’m glad I did. I finally began to understand and appreciate the game. Football has a reputation for its toughness, but I realized that good players have to be smart too. It’s still hard to follow, but I’m getting better at it. It helped when I sat next to someone other than Billy who understood the game and didn’t mind explaining things to me. Guido’s team had a 10-2 record. They beat their biggest hometown rival to make it to the state championship. Even though they lost the state championship game, they had an amazing season. You can see Guido’s highlight tape on YouTube. Guido’s highlight tape. I worked in the same building twice, each time for a different company. Now that I think about it, it was pretty awesome working in such a famous and historic building. The building used to be part of Reynolds Metals Company’s corporate headquarters. The complex took up a small part of a 120 acre parcel that used to be a horse farm. In fact, before the restaurant facing Broad Street was built, you could still see the concrete steps that led up to the farmhouse. Gordon Bunshaft, a world renowned corporate architect, designed the main building, formerly called the EXO (Executive Office Building). Completed in 1958, architectural historian Richard Wilson said it “exemplifie[d] the genius and promise of post World War II American modernism.” According to the application for listing on the National Register of Historic Places filed in 2000 (from which all these facts were derived), the EXO is “a monumental testament to architectural excellence . . . classically elegant and subtly innovative.” The EXO was indeed named to the National Register of Historic Places, one of the rare late 20thcentury buildings on the list. Because Reynolds Metals was first and foremost an aluminum company (it also owned gold mines in Australia) the EXO was designed to be a showcase for aluminum products. Everything that could be made of aluminum was made of aluminum, for a total of 1.2 million pounds. From the cladding on the columns, walls, millwork and doors, to the file cabinets, desks and chairs, to the paper trays, pencil holders, planters and wastebaskets, down to the aluminum threads in the drapes and carpets, it was all aluminum as far as the eye could see. There was no wood anywhere to be found when Reynolds owned the building, at least as far as I could see. Among the most innovative features was the 14-foot high aluminum solar louvers on the east and west sides of the building. These louvers, painted a bright blue (Reynolds’ signature color) were supposed to shift throughout the day based on the calculations of an astronomical clock. On overcast days, an electric eye was supposed to override the clock and keep the louvers open to allow maximum natural light. During both my tenures in the building, however, they never worked properly. Although I was supposed to have a view of the courtyard from my office, mostly I had a view of the blue louvers. I always hated those louvers. Nevertheless, the building was majestic. There is a large reflecting pool in front bordered by huge willow oak trees. The building sits on a podium with a cantilevered projection that made for an impressive entrance when people were allowed to drive up to it. When I worked there before, there were only three main buildings on the property. The rest was woods, intersected by walking paths. The National Register application described the setting as “unspoiled” and “pastoral.” Charles Gillette, a well-known Richmond landscape architect, designed the landscaping, which was beautiful. Indeed, the entire property was gorgeous, mainly because most of it was covered with trees. When Alcoa bought Reynolds, the EXO was sold to the University of Richmond, which in turn leased it to the current occupant. They renovated the inside of the EXO, replacing some of the aluminum with much needed wood finishes. I have to say, it looks much better now. Meanwhile, the Reynolds family kept the rest of the property, renamed it “Reynolds Crossing,” (they kept the signature blue color) and started to market it as an “award winning mixed use development.” Reydev.com/Reynolds_Crossing. The website touts the “Class A” office buildings and describes the property as “a prime destination retail location,” which they optimistically call “The Shoppes at Reynolds Crossing.” The only “shoppe” on the property so far, however, is a Walmart under construction. The area looks so different now. Most of the trees are gone. You can see clear through to the interstate. The speed bumps on Forest are long gone and the traffic grows every day. I’m not one to pine for the past. The future marches on whether we like it or not. I don’t mind change, either. Change keeps us moving and growing. And I would have enjoyed having a Walmart so conveniently located. But there’s something about it that makes me sad. I think about how it used to be an oasis of green surrounded by a sea of concrete and traffic. I think about the horse farm that used to be there. I think about a picture I once saw of the aluminum desks lined up in rows just like in Mad Men. I think about how those willow oaks have grown from saplings to huge trees with large green canopies. No more sleeping with the past. Time to move on to new adventures. I once worked for a lawyer who was so wicked that he reportedly withheld his daughter’s cancer treatments in order to coerce his estranged wife into coming back to him. It worked. It seems there is at least one of these in every organization, if not every department. I mean that one person who is so dishonest and unethical, so universally disliked, and yet they always seem to escape repercussions for their abhorrent behavior. “Nemesis” was our resident Beelzebub. Virtually every attorney who had the misfortune of working for or with her went to HR to complain. One lawyer even quit rather than work for her. When I went to HR, the rep said: “We can’t change her behavior but you can change how you react to her.” What? We can’t change her behavior? Her behavior that so obviously violates the company’s values of “integrity, trust and respect?” She was a walking ITR violation. Those words were mocking me again. How many employees had to complain—or quit—before the company would discipline her? Or even better, fire her. There was a reason why management turned a blind eye to her antics and let her terrorize the minions. Everyone knew the reason but no one would ever say it out loud. And I’m not going to either. Suffice it to say that people like Nemesis do a disservice to those who are truly qualified and deserve their positions. On one occasion, I dropped all my normal responsibilities to work on a contract that fell within her area of support. I did it because I knew I could do it faster, cheaper and better than outside counsel, and in my judgment, that’s what the project needed. So I cancelled all my standing appointments with my regular clients, cancelled my regular office day at the Commerce Center, and did not return any of my clients’ phone calls. I worked only on this contract for the entire week. It wasn’t easy, either, because the clients kept changing their minds as to what they wanted in the contract. I turned draft after draft. I finished the contract on Friday. Late that afternoon, one of her minions sent me a message asking me to review a presentation for the sales folks describing the contract. I politely declined, citing the fact that the contract had not even gone to the supplier and therefore we had no idea what it was going to look like in final form. I said I thought it was a little early to be preparing a summary deck. Also, I said I didn’t know anything about sales. Finally, I pointed out that I needed to get back to my regular clients. There’s also the fact that the minion should have read the contract and therefore should have been able to review the deck herself, but I did not point that out to the minion. Why is it that other people can throw turds over the fence at me, but it’s never the other way around? I was livid. I responded with much the same message I had sent to the minion, plus I pointed out that I had taken over another person’s job in addition to my own. She responded with more insults. At that point I stopped responding. When I went to talk to my boss about it, she didn’t support me at all. Instead she said I shouldn’t have engaged in the dialogue with Nemesis in the first place. Thanks for watching my back, boss. On Monday, Nemesis came to my office to talk about it. She seemed to think that all we had to do was hug and everything would be ok. I told her I had expected to receive a thank you from her, not a slap in the face. Her eyes widened in surprise. “You expect me to thank you for doing your job?” she asked. She just smiled that Cheshire Cat grin she got when she was about to throw someone under the bus and left my office. The next day my boss dismissed me from the project. I know I should have been happy at that point, but I was pissed. I knew it would eventually come back to bite me. And it did. I got sideways with some of the lawyers in the department (mostly the direct reports and their protégées) pretty quickly, which dismayed me because I had always been able to get along with even the most difficult of clients. I knew how to build rapport with people so I could deal with them effectively. You have to get to know people, however, before you can build rapport with them and create a collaborative working relationship. In this department there were virtually no opportunities to get to know my colleagues. No communication, no rapport, no collaboration. At first I blamed myself when these mishaps occurred. I left many of my weekly meetings with my boss in tears because I had stepped on someone’s toes without knowing it. Here I was, a 50 year old woman with over 25 years of experience as a lawyer, and I’m trying to hide my tears as I walk down the hall to my office. Talk about a walk of shame. For example, I worked on a company policy that required employees to report violations of some sort. One of the issues we discussed at our meetings was whether employees should report all violations or only the material ones. Trouble is, it’s hard to define what is trivial and what is serious. My view was the employees should not have to try to define what is “material.” I argued that this is subjective and open to interpretation. My view was that it is better to over-report than underreport. Once the team finished drafting the policy, it was sent to the governance committee for review and approval. I was not invited to this meeting, so I did not get the chance to explain why we did what we did. Sure enough, when the final policy came out, the word “material” had been inserted. Silly me, I thought my point of view should—and could — be expressed. I figured if they knew why I had omitted the word, they would take it out. Or at least we would discuss it. So I sent an e-mail to the members of the committee in which I politely explained why we had intentionally left it out. At my next meeting with my boss, I got reprimanded for sending the e-mail. I was surprised, to say the least. It seems I had ticked off the lawyer member of the committee, who was one of the GC’s direct reports and a long time member of the department. Supposedly I had violated one of the law department’s counseling principles, which was to “speak with one voice.” The problem with this principle was that there was so little communication inside the department that it was impossible for me to know what that one voice was supposed to say. And it became readily apparent to me that the “one voice” was the voice of the direct reports, not a minion like me. That one inadvertent slip impacted my performance rating for three years. Three years. Never mind that I put a contracting process in place that saved the company $2 million every year. No, what mattered was that I had ticked off a big wig in the department. Why didn’t he come and talk to me himself if he was angry? His office was just down the hall from mine. Ah, the prerogative of the prima donna. Get someone else to do your dirty work while you polish your tiara. Passive aggressiveness is so much more fun than confronting an issue directly. One might think that I would have learned my lesson after this first humiliation, but I did not. Why? Because I could never tell where the landmines were hidden. They were everywhere. Next example: I supported the purchasing department, and one of my colleagues supported Finance. Sometimes there was overlap on issues, and the clients would get confused as to who they should call. One of the purchasing agents set up a meeting with the colleague and me to get “role clarity”, which is a fancy way of saying who is supposed to be doing what. When the meeting notice went out, the colleague called me and asked what the meeting was about. I told him. On and on he went with his tantrum until I finally told him his swearing was inappropriate and I hung up. He got to my boss before I did and I got in trouble. Never mind that he had yelled at me, not the other way around. Never mind that our company values include the words “integrity, trust and respect.” Those words would taunt me for years. I took the whipping like a weak puppy and slunk back to my office. Third example: Another colleague asked me for my opinion on a contract issue. By this time I had been practicing contract law for a number of years. There aren’t a lot of rules for contracts. Businesses have a lot of latitude in what they do. You figure out what works mostly through experience and common sense. What I didn’t know at that time is that in-house lawyers in this department were not supposed to give their own opinions. I guess they were supposed to call outside counsel and ask them. An opinion from an in-house lawyer didn’t seem to be valid until it had been confirmed by outside counsel. But I didn’t know that, so I sent him my opinion. As I said, there aren’t a lot of statutes or case law on contracts, so I said “experience and common sense.” It was the truth, but he apparently thought I was being snide. Once again, instead of dealing with me directly, he, like the two other lawyers before him, complained to my boss. Once again I left her office in tears. These episodes pulverized my confidence and self esteem. I would go home at night demoralized. Every morning before I left for work my husband would give me a pep talk so I could face the day. I’m a stress eater so my weight would balloon up and then I would diet and it would go down, and then I would get upset and start to eat, and the cycle would repeat itself endlessly. I began to lose interest in my hobbies and my children’s activities. I admit I am direct and blunt at times, and obviously I can’t keep my mouth shut. But the irony of the situation was that my clients liked that about me. They appreciated my honesty and directness. When they asked questions, I gave them practical answers that they could use instead of legal mumbo jumbo. I thought that was what lawyers were supposed to do—serve their clients. 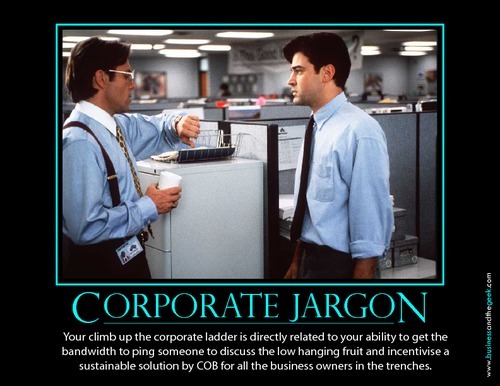 We had some jargon at the law firm, but nothing like this. My favorite term from the law firm was “beauty contest,”which is when a law firm puts on a presentation for a prospective client. I picture a dozen fleshy, middle-aged men wearing Speedos and parading around a conference table. Yikes. Corporations take euphemisms to an entirely new level. DISCLAIMER: These are my opinions and do not represent the opinions of any organization. The events described in this blog did occur, but the names have been changed and some of the details altered. One naturally has high hopes when starting a new job. For me, however, the fit was not good from the start, and it had nothing to do with the fact that the company makes a product that kills people. After all, tobacco is still legal and people have the choice to use it or not. I did not have a problem working for a tobacco company. No, the fit I’m talking about is cultural. There were many red flags that warned me about the culture when I arrived in the law department, but I chose to ignore them. I should have listened to my intuition. The gut never lies. Red flag number 1: I found myself working in the same building, on the same floor, and in the exact same location as I did when I worked for the previous owner. How was that a red flag? I got laid off from my former employer. Twenty years later I found myself back at the same place. It was a bad omen. I convinced myself that this time it would be different. And it was. It was worse. Red flag number 2: My computer went down and it took a whole day to fix it, and no one cared that I couldn’t get any work done for an entire day. I’m paid to work and I take that quite seriously. When I was at the law firm, we billed in either 15 or 6 minute increments. If the lawyers weren’t billing the clients, the law firm didn’t make money. So, when there was a computer problem, the IS department sent someone up immediately. Not at this job. I had to call the help desk in India. When I called, it took about 10 minutes (no exaggeration) to verify my name and location. The service agent, who didn’t know English very well and had a thick accent, could not find my name in the system. Apparently the name Scruggs is very difficult to comprehend. He kept spelling it wrong. Then it took another half hour to explain the problem, at which point the agent Googled the issue to try to find a solution. I am not lying. He told me so. After about an hour on the phone, the agent gave up and escalated the issue to desk side support, which are the people located in Richmond, not India. Desk side support did not show up until up the next day. Productivity was obviously not one of the company’s values. Red flag number 3: My secretary was laid off a few months after I started working, and no one told me. I found out when she sent me an e-mail telling me had enjoyed working with me. This turned out to be symptomatic of the lack of communication in the department. As I discovered, information sharing was on a “need to know basis,” and it seems that no one thought I needed to know that my secretary was being downsized. Red flag number 4: No one in the department seemed to be very happy. I’m a friendly person and one of the things I like best about living in the South is that people are friendly; they say hello to everyone. But not here. Walking down the hallways, I noticed that the lawyers didn’t say “good morning” or “how are you”, etc. The administrative staff, on the other hand, was very welcoming. I also noticed that lawyers didn’t chat with each other. You know, standing in the doorway shooting the breeze sort of thing. It seemed rather odd to me, especially coming from a law firm that truly did value collegiality. Instead, I got the impression that people weren’t really happy that I was there. It was as if they all viewed me as competition. I felt like a dolphin in a shark tank. To be fair, most of the lawyers were very nice on a one to one basis, once I got to know them, but there were precious few opportunities to do so. This place was all work. I can understand that lawyers working for a tobacco company must avoid gallows humor, but come on, a little laughter never hurt anyone. Red flag number 5: No department Christmas party. This may seem like a minor thing, but to me, it says a lot about the management and the department culture. It is the way that the head of a department tells her employees that she appreciates them and the work that they do. I think it has a big impact on morale, which in turn impacts productivity. Low morale means lower productivity. When employees don’t feel that their work is appreciated, they don’t feel loyal to the organization. This translates into more sick days, more surfing the web during business hours, and probably more stolen office supplies. In early December, I attended the quarterly lawyer’s meeting–just lawyers, no staff. The meeting started with a nice lunch (which was eliminated from future meetings) and then we sat through four hours of presentations. Around 4:30, the rest of the law department (admins and paralegals) came into the auditorium. GC gave out a few recognition awards to the staff and then wished us all a Merry Christmas. My God, I thought. This is it. This is the Christmas party. There wasn’t so much as punch and cookies for the staff. Not even leftovers from lunch. I was shocked. Every other place I had worked had some sort of Christmas party. In my previous in-house job, the General Counsel had everyone over to his house. The stage was set for my downward slide. The amazing thing is that it took six years for me to hit bottom. (You may be wondering why I stayed so long if it was so bad. I’ll explain that in another entry).